By all accounts, Fanny Mendelssohn Hensel was a child prodigy, the equal of the brother Felix. Receiving the same musical training, they matured together as musicians, supporting each other, critiquing each other’s music and maintaining an extremely close connection throughout their lives. Due to the behavioral customs of the time, however, Fanny was prevented from having a professional career and had to limit her composing and performing to concerts at home. Early on, some of her songs were published under Felix Mendelssohn’s name. Finally in the last years of her life she developed the independence to publish her compositions. After Fanny’s marriage to the court artist Wilhelm Hensel, the couple moved into a home on the large estate of Fanny’s parents at 3 Leipziger Strasse, Berlin. 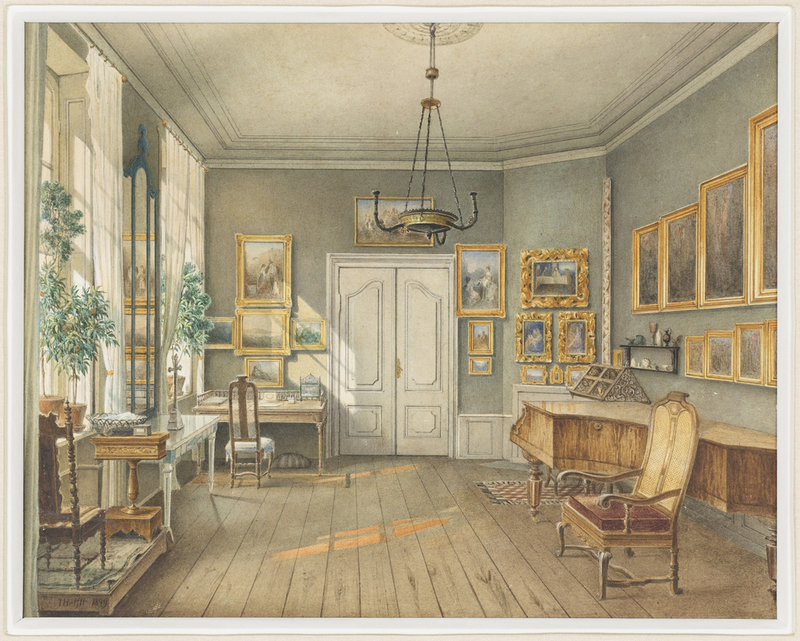 It was there that Fanny had a room devoted to her music as portrayed in this watercolor executed by Julius Helfft. Painted two years after her death following a stroke, the watercolor must have been commissioned as a tribute to Fanny. A music pavilion accommodating about 300 people was constructed in the garden of 3 Leipziger Strasse that served as the venue for Sunday concerts by Fanny and invited guests. It became a center of musical and social life in mid-century Berlin. Biographers say that Hensel and Felix Mendelssohn were devastated by Fanny’s death and suffered from deep depression. [iii] Felix Mendelssohn died less than six months after his sister. In 2010, the Mendelssohn Archive in the Staatsbibliothek, Berlin was able to acquire a second Helftt watercolor of the Music Room (55P111) showing a corner of the room with the piano, music stand and pictures hanging on the wall behind. Today, the music and career of Fanny Hensel are at last coming to public attention. [i] For the history of the Mendelssohn family and businesses see Thomas Lackmann, Die Familie Mendelssohn und ihre Gräber vor dem Halleschen Tor, Berlin: Nicolai, 2014. [ii] R. Larry Todd, Fanny Hensel: The Other Mendelssohn (London: Oxford University Press, 2010), pp. 19-20. [iii] Eugene Gates, “Fanny Mendelssohn Hensel: A Life of Music within Domestic Limits,” The Kapralova Society Journal, vol. 5, no. 2, p. 12. The chair and table in the left foreground are placed on a low platform. What would have been the purpose of the platform?